Yesterday was Ginger’s last Sunday of vacation, so I spent the morning, once more, reading Sara Miles. The heart of her book is about starting a food pantry at her church in San Francisco. In the process of telling her story, she says some profound and confrontive things about faith and action. As a grateful member of the United Church of Christ, I’m a part of a denomination that willingly owns the labels “liberal” and “progressive.” Words like justice, peace, and inclusiveness are a regular part of our vocabulary. Someone has said if Christianity were a neighborhood, the UCC would be the last house on the left. When I read about Miles’ Episcopal church in San Francisco, I imagine her congregation is not so different from the ones I’ve known in the UCC: mostly well-off and well-intentioned white people whose faith matters to them and who as averse to being made uncomfortable by their faith as anyone else. I think we do want our faith to matter to us and what we do with our lives to matter to God and to others, and it’s hard to break out of our patterns of faith, action, and relationship to be converted and transformed by the Spirit. As Miles talked about the growing pains and gains of the food pantry, she said, “We were all converting: turning into new people as we rubbed up against each other” (138). I immediately thought of fiddlehead ferns. (Didn’t you?) 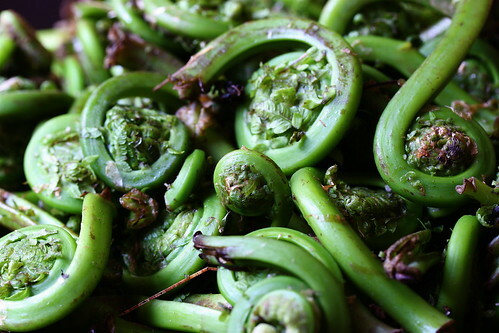 To clean fiddleheads before you cook them, you put them in water and rub them up against each other. The dark outer layer – dirt, skin, whatever – comes off leaving a beautifully bright green skin that sparkles in the sauté pan. They don’t clean up well one by one; they have to rub up against each other to be transformed. Where had all the people like Nirmala been, all the years that St. Gregory’s was holding services and trying to entice worshippers, one or two at a time, into the experimental liturgy? The people who came to get food at the pantry had been, to regular middle-class churchgoers, basically like Jesus – that is, invisible. We knew they were there, but we couldn’t see them, and their sufferings and loveliness were imagined, not incarnate in a specific body. Chef made a mistake during service last night. He knew we were going to be busier than usual for a Sunday because of the holiday weekend, but he only put one dishwasher on the schedule. Since Sunday is usually Chef’s day off and he worked, he left about eight-thirty. As Ashad and I were cleaning up after service, he commented on the huge stack of dishes that faced Leonardo, our Brazilian dishwasher who leaves work at eleven or so to go to his second all night job. “We should help him,” Ashad said. I finished wiping off the counters and headed back to the dish room. I started rinsing things out and stacking them so Leo could begin washing. Ashad joined in a couple of minutes later and began putting away the things that were clean. By staying an extra twenty minutes we had cleared the dish area and kept Leo from being there for a couple of extra hours. Sous saw what we were doing and had a couple of cold beers waiting for us to say thank you. It wasn’t about doing the dishes nearly as much as it was about helping Leonardo. We work together, we rub up against each other; we are being transformed. This is what gets left out, I was realizing: not just left out of the national public debate but also left out of religious discourse. Politicians talked about welfare – usually to blame and scapegoat – and occasionally made speeches about poverty. There was no shortage of talk about the poor and social service from church leaders off all stripes. But the experiences of people such as my volunteers, the texture and specificity of their incarnate lives, were missing from the story of what Christianity was like now in contemporary America . . . The thing that astonished me sometimes – listening to tales of terrible damage, psychosis, loss – was not how messed up people could be but how resilient; how, in the depths of suffering, they found ways to adapt and continue . . .
At the last church I served, as part of my sermon one Sunday I had people get up and physically change seats as a way of encouraging them to find a new perspective. At deacons’ meeting the next week, one person was less than complimentary of the sermon. “I don’t do come to church to be made uncomfortable,” she said. Ouch and amen. I like that. Sara Miles rocked my conservative evangelical world. That book messed me up. In a good way. I saw the thing on Kiva, too, and am talking with my kids about getting involved. I’ve never heard of fiddlehead ferns. Really thought-provoking post. I sometimes wonder how much of what we do is because we have no choice if we are to keep any self-respect. I’ve never heard of fiddle-head ferns being cooked either. Thanks for the comments. I forgot to link to the fiddle head recipe I posted last spring. thanks so much for posting the story on Kiva. 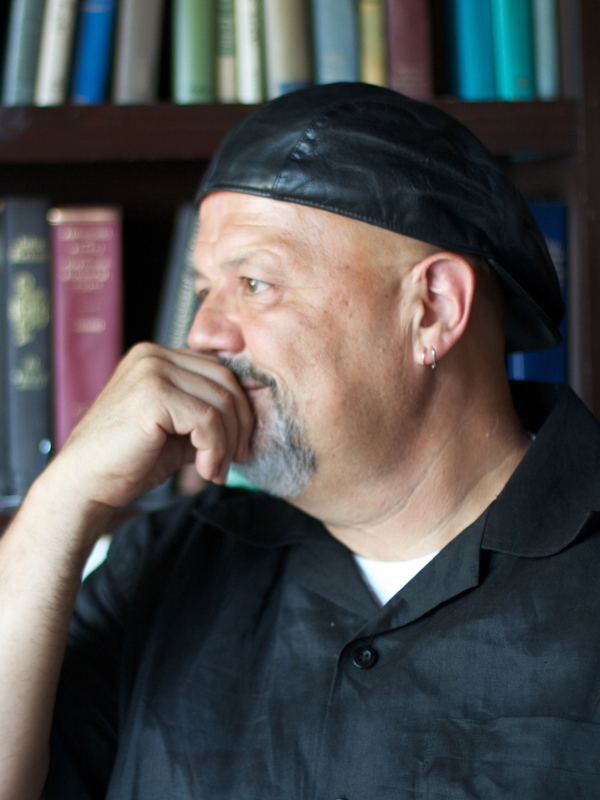 Re the deacon who didn’t want to be made uncomfortable at church. That’s an honest commentary on what church is for many people. One of the most meaningful communion experiences I’ve had at a church where homeless people sometimes wandered into the services. When the bread (which was always really bread) was passed to one obviously homeless man, his eyes lit up and he took more than just a pinch. One of the things I’ve never understood about Communion is why we all seem to take so little. You’d think, when offered the Body of Christ, we would grab a handful, or at least enough to chew on. I love Sara Miles’ book. In fact, I just sent it to my mom for her birthday (72 and going strong). I gave my copy to my priest. Now I wish I had it back!